The basic covered call trader will write a call and wait until it expires then decide what action to take next. I suggest that you monitor your position and determine what changes to make before expiration to enhance your profit or decrease your downside risk. Determine the price you want to close the position and then set an automatic stop order. For example, you entered a covered call and you do not want to let the stock decline so you enter a stop order to but the sold option at market and then sell the stock with both events triggered by your predetermined stock price. Let the option go until expiration and then make your next move. This strategy does not mean you will lose money but you will keep selling calls to minimize any stock price decreases over time. If the price of any option you sold declines to a small amount, then buy the option back to lock in profits on the option. If the option price drops to 25 cents per share or less, then you can buy it back with the different between sold option price being a profit. The second option is to watch the time value of an in-the-money option and buy it back when the time value gets low. the rationale is that you have made most of the profit already as time value can only go to zero. If there is only 10 or 20 cents left, you can buy to close and sell another option for more premium income. There is no right or wrong strategy based on these two methods to trade covered calls. You should decide if you fall into the first scenario (less monitoring) or the second (more activity) based on your time commitment to your covered call trades. In a later post, I will discuss my way of trading covered calls based on a strategy that takes option obligation and stock price into consideration. At Get Rich Investments, we focus on creating monthly income. One strategy is to sell puts on select stocks we identify being in a break out stock price position. The concept is simple, stocks with momentum will move higher in the short-term time period. To make monthly income, we sell puts on these stocks to capitalize on the price movement. If it moves higher, the value of the puts will decline. Investors can then buy to close the puts to lock in gains. Then, back to selling puts for more monthly income if the stock is still a great selection. This can be a great strategy for monthly income as momentum stocks we trade have recently had a price breakout from a previous trading range. It’s alright for a stock to move up within a nice trading range. This makes the amount of premium collected higher based on some volatility. But we do not want to risk our trading capital by taking big losses so we exit the position to take profits in many cases. On September 29 we entered a PUT trade on Gaslog (GLOG) that expired with a 6% gain. For subscribers, we sold puts on Grubhub (GRUB) that expired with a 6% return in our November Monthly Income Plan. GLOG: For medium risk option trade, look to sell an November 2017 17.5 PUT for about $1.00. This creates a return of 6.0% with 49 days to expiration. This is an annualized 45% return. GRUB: Subscribers: Look at the November 2017 52.5 PUT trade. For each 100 shares of GRUB stock you want to control, sell one Oct 2017 52.5 PUT option for a $3.00 debit per option or better. That’s potentially a 6.0% return on the PUT trade. Why would an investor sell put options instead of just buying the stock? You already know my response to this question – to create monthly income. These trade examples are proof that we can earn high returns on income trades. We monitor the market looking for stocks poised for break outs to sell puts for income. We provide several trades in the monthly income newsletter and several additional trades as opportunities arise. As income investors, we seek to create consistent monthly income by selling options to collect monthly premiums. This has been successful for our investors for years. Option selling offers another method to diversify investing strategies beyond traditional dividend investing. We have combined technical stock events with our strategy to identify high returns option selling opportunities. This income trade will generate a return of 45% annualized. We are coming off great trades such as RES and STM. Stock: Gaslog (GLOG) is an international owner, operator and manager of liquefied natural gas (LNG) carriers. The Company provides support to international energy companies as part of their LNG logistics chain. The Company’s owned consolidated fleet consists of 27 LNG carriers, including 22 ships in operation and five LNG carriers on order. Trend: We have detected a “Continuation Diamond (Bullish)” chart pattern formed on GasLog Ltd (GLOG). This bullish signal indicates that the price may rise from the close of 17.45 to the range of 22.00. The pattern formed over 244 days which is roughly the period of time in which the target price range may be achieved. GasLog Ltd has a current support price of 16.80 and a resistance level of 17.60. 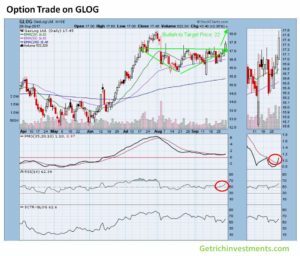 Strategy: We have an opportunity to sell options for income with GLOG as the stock should trade higher in the coming weeks. I recommend to place your trade and exit when you have locked in profits due to the stock price moving higher. Our goal here is to make income short term so we can exit and compound capital into another trade. For medium risk option trade, look to sell an November 2017 17.5 PUT for about $1.00. This creates a return of 6.0% with 49 days to expiration. This is an annualized 45% return. For a conservative trade, you can setup a covered call trade. You can purchase 100 shares of RES and sell an November 17.5 CALL option for about $0.80. As income investors, we seek to create consistent monthly income by selling options to collect monthly premiums. This has been successful for our investors for years. Option selling offers another method to diversify investing strategies beyond traditional dividend investing. We have combined technical stock events with our strategy to identify high returns option selling opportunities. This income trade will generate a return of 12% return. Stock: Spark Therapeutics, Inc. (ONCE) is a gene therapy company. The Company focuses on treating orphan diseases. It has a pipeline of product candidates targeting multiple rare blinding conditions, hematologic disorders and neurodegenerative diseases. Its pipeline includes a product candidate targeting choroideremia (CHM), which is in a Phase I/II clinical trial and a product candidate for hemophilia A, which is in a Phase I/II clinical trial. Its product investigational candidate, voretigene neparvovec, is intended to treat a genetic blinding condition or inherited retinal disease (IRD). 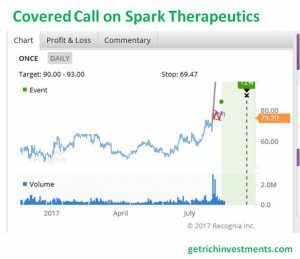 We have identified a a pattern called Flag (Bullish), providing a target price for the short-term in the range of 90.00 to 93.00 on Spark Therapeutics (ONCE). The faster moving average recently crossed above the slower moving average, signaling a new uptrend has been established. A Flag (Bullish) is considered a bullish signal, indicating that the current uptrend may continue. After a steep rise in price, the pennant reflects a temporary pause in the uptrend, consisting of two parallel trendlines that form a rectangular flag shape. Spark Therapeutics announced on August 9 the closing of the previously announced underwritten public offering of its common stock pursuant to an automatically effective shelf registration statement that was previously filed with the Securities and Exchange Commission, including the exercise in full by the underwriters of their option to purchase an additional 690,789 shares from Spark at the public offering price of $76.00 per share, less the underwriting discount. The exercise of the option brought the total number of shares sold in the offering to 5,296,053, and increased the aggregate net proceeds to Spark to approximately $380.4 million, after deducting underwriting discounts and before offering expenses. Strategy: We want to sell a covered on ONCE using the September 2017 80 Call. For each 100 shares of ONCE stock you buy, sell one Sept 80 PUT for a $3.50 credit or better. Your cost of the trade is ~$71.75 or so on a stock currently trading above $75 per share. That’s potentially a 11.5% return in 28 days for an assigned trade. This is a great example of how investors can create monthly cash from these income producing strategies. This is an excellent way to create a side hustle income without consuming too much of your time each day. For others, they have built an income large enough to live on without being employed by the man. When your monthly income exceeds your living expenses, you have achieved financial independence. For subscribers, we have been selling puts on JP Morgan (JPM) for several months. We consider this a perpetual income play by selling options for monthly premiums. In fact, we have collected over $1500 in monthly cash during the past 6 months! This is a great way to create investing income that exceed the typical dividend strategy. As income investors, we seek to create consistent monthly income by selling options to collect monthly premiums. This has been successful for our investors for years. Option selling offers another method to diversify investing strategies beyond traditional dividend investing. We have combined technical stock events with our strategy to identify high returns option selling opportunities. This income trade will generate a return of 13% annual return. Stock: JPMorgan Chase & Co. operates as a financial services company worldwide. It operates through Consumer & Community Banking, Corporate & Investment Bank, Commercial Banking, and Asset & Wealth Management segments. 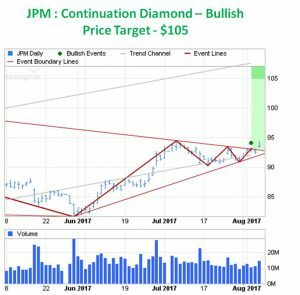 We have identified a “Continuation Diamond (Bullish)” chart pattern formed on JPMorgan Chase & Co (JPM on NYSE). This bullish signal indicates that the price may rise from the close of 93.11 to the range of 105.00 – 107.00. The pattern formed over 143 days which is roughly the period of time in which the target price range may be achieved. JPMorgan Chase & Co has a current support price of 91.28 and a resistance level of 93.19. The RSI is above its neutrality area at 50. The MACD is positive and below its signal line. The stock could retrace in the short term. Moreover, the stock is trading above both its 20 and 50 day MA (respectively at 92.13 and 89.17). JPMorgan Chase is currently trading near its 52 week high reached at 94.51 on 06/07/17. Strategy: We want to sell a cash secured put on JPM using the September 2017 92.5 PUT. For each 100 shares of JPM stock you buy, sell one Sept 92.5 PUT for a $1.35 credit or better. That’s potentially a 1.5% return in 41 days or 13.3% annualized return compared to a 2.1% annual dividend yield. For investors wanting to take a long position in JPM, this lowers the stock price for entry as each premium received lowers your initial cost basis. You can continue to sell monthly put options until the stock is put to you. Then, you can sell covered calls each month for additional monthly income. And, you collect the stock dividend. In our Monthly Income Report, we look for opportunities to utilize option selling to generate consistent income. While we focus on selling cash-secured puts and covered calls on high quality stocks, we sometimes identify high return trades for increased income. These are stocks with positive confirmation and continuing chart trend based on technical analysis. This month we have identified a stock with a bullish technical indicator that has potential to generate a 12% return in only 40 days. Stock: CF Industries Holdings, Inc. (CF) manufactures and distributes nitrogen fertilizer, and other nitrogen products. The Company’s nitrogen fertilizer products are ammonia, granular urea, urea ammonium nitrate solution (UAN) and ammonium nitrate (AN). Its other nitrogen products include diesel exhaust fluid (DEF), urea liquor, nitric acid and aqua ammonia, which are sold primarily to the Company’s industrial customers, and compound fertilizer products (nitrogen, phosphorus and potassium or NPKs). The Company’s segments include ammonia, granular urea, UAN, AN and other. The stock has pulled back from its February levels due to industry pricing pressures. Revenues are likely to rise 13% in 2017 and 6.9% in 2018, after falling 15% in 2016. We see steady North American fertilizer demand growth in 2017, but some pressure on prices. However, new production is likely to lead to increased volumes for CF in 2017. We think market conditions will start to improve with this earnings release as capacity additions slow and Chinese capacity reductions continue. 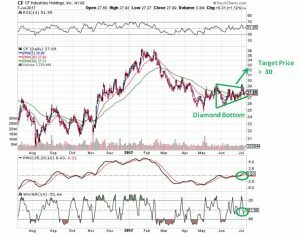 This stock has formed a diamond bottom pattern (Bullish), providing a target stock price for the short-term above $30 per share. We think the stock can hit the target price within 6 weeks or less. The price recently displayed stronger RSI and positive PMO movements signaling a new uptrend has been established. The Short-Term KST indicator has triggered a bullish signal by rising above its moving average. Recent bullish option flow has been detected in CF Industries with 5,006 calls trading, 3x expected, and implied volatility increasing almost 4 points to 41.09%. Aug-17 32.5 calls and Aug-17 30 calls are the most active options, with total volume in those strikes near 2,500 contracts. The Put/Call Ratio is 0.22. Earnings are expected on August 2nd. Strategy: CF is currently trading at $27.89 per share. We want to sell a cash-secured put option on CF using the August 2017 30 Call. For each 100 shares of CF you want to control, sell one August 30 PUT option for a $3.00 credit or better. That’s potentially a 12.0% assigned return in 40 days. Exit Trade: Be prepared to exit the PUT (buy to close) when the stock price moves above $30 to lock in profits. If not, there is a chance the stock may be put to investors. If this happens, then investors can sell covered calls for monthly income until the stock is called away. This is a higher risk trade than we normally place in the Monthly Income Report. However, this is a nice setup with a high volatility play, positive chart technical confirmation and increased premium from selling options for monthly income. In our Monthly Income Report, we look for opportunities to utilize option selling to generate income. While we focus on selling cash-secured puts and covered calls on high quality stocks, we sometimes identify high return trades. We like to have 2 or more stock or company events leading to positive confirmation that the stock will continue its trend. This month we have identified a stock with a bullish technical indicator that has potential to generate a 10% return in only 45 days. Stock: Alkermes plc (ALKS) is a biopharmaceutical company. The Company is engaged in the researching, developing and commercializing pharmaceutical products that are designed to address medical needs of patients in therapeutic areas. The Company has a portfolio of marketed drug products and a clinical pipeline of products that address central nervous system (CNS) disorders, such as schizophrenia, depression, addiction and multiple sclerosis (MS). Alkermes just announced positive preliminary top line results from ENLIGHTEN-1, the first of two key phase 3 studies in the ENLIGHTEN clinical development program for ALKS 3831, an investigational, novel, once-daily, oral atypical antipsychotic drug candidate for the treatment of schizophrenia. ENLIGHTEN-1 was a multinational, double-blind, randomized, phase 3 study that evaluated the antipsychotic efficacy, safety and tolerability of ALKS 3831 compared to placebo over four weeks in 403 patients experiencing an acute exacerbation of schizophrenia. The study also included a comparator arm of olanzapine, an established atypical antipsychotic agent with proven efficacy. ALKS will announce earnings on July 27 but should be positive on this news. 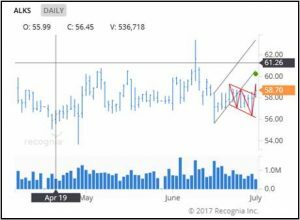 This stock has formed a pattern called Flag (Bullish), providing a target price for the short-term in the range of 61.50 to 62.30 (see chart below). We think the stock can hit the target price within 6 weeks or less. The price recently crossed above its moving average signaling a new uptrend has been established. While we like the upside potential in ALKS, we want to protect the downside against market changes. Strategy: We want to sell a covered call on Alkermes using the August 2017 60 Call. For each 100 shares of ALKS stock you buy, sell one August 60 covered call option for a $54.50 ($58.70 – $4.20) debit or better. That’s potentially a 10.0% assigned return with a 7% downside protection. If you want more downside protection, you can purchase an August 55 PUT for less than $2.00 per option. This is a higher risk trade than we normally place in the Monthly Income Report. However, this is a nice setup with a positive news announcement, positive technical confirmation and increased premium from selling options for income. Let more about creating monthly income here. “Bad market timing and poor stock picking kept most investors from fully reaping the gains of the bull market last year. “The average investor held too much in cash, was too concentrated in stocks that didn’t perform well and avoided financial stocks that rallied last year,” said Hart Lambur, co-founder and CEO of Openfolio, a social network with more than 70,000 members who share their investment portfolios. The average investor on Openfolio had a gain of roughly 5 percent in 2016. That lagged the nearly 12 percent total return of the S&P 500, which includes dividends, by more than 7 percentage points last year. How can investors beat the market? Our newsletter beat the S&P 500 handedly in 2016 with a 27.8% return! In reviewing the results we obtained from the perpetual covered call strategy during the past year. In terms of total return as tracked in the monthly spreadsheets, the average across all positions was 27.8% during 2016. In the past year ending 12/17, the S&P 500 only returned 12.75% and the DJIA returned 16.8%. Therefore, we more than doubled the S&P and beat the Dow Jones significantly while generated significantly more income. The average monthly income across our open positions was $152 for each position with 100 stock shares! AND this includes the cost of having a long put to protect against downside risk on each position. Join our investing community and beat the market in 2017! Grace Groner started her career as a secretary at Abbott Laboratories more than 80 years ago. Four years into her job, she purchased three shares of our company stock for just under $200. She held on to those three shares until she died, in 2010. Those three shares alone made her a multimillionaire. She could thank the company dividend — and the miracle of compounding — for her $7 million fortune. Grace wasn’t abnormally lucky. Any investor who bought $1,000 worth of high-dividend-paying stock 75 years ago would have about $3 million today. Are you ready to start your million dollar journey? You can learn how to compound your money even faster than Grace. To do this, you need consistent returns to increase your dollars being compounded. Secondly, you need monthly income to accelerate the compounding effect. Lastly, you need an investment plan to achieve your goals. These returns result in a 4 month return of 9.2% when compounded and near 30% when compounded annually! Join the Monthly Income Plan today. Let’s walk through an example of how to sell a put. After careful selection of the right stock, you decide you would like to create a monthly income stream by selling puts each month on this stock. Let’s say the stock is currently trading at $70 in the market. After reviewing the option chain, you decide to sell the 67.5 put option on this stock that expires in one month. The 67.5 strike price is out of the money and will obligate you to buy the stock at $67.50 only if the put buyer decides to exercise the option on or before the expiration date. The put buyer will only exercise the option if they make money or if the stock price is below $67.50. As the put seller (writer), you get to collect the cash premium for the option. In this case, let’s assume it is $200 per option contract or 100 shares of stock. The investor now has a risk of $67.50 – $200 = $65.50 per option contract sold. If this amount of $6550 per contract is in the investors brokerage account, this is a cash-secured put. The potential return is $200 which the put seller will keep regardless of the trade outcome. The investors return is calculated as $200/$6550 or 3.05%. This is a nice return on a one month put option. On an annual basis, this is a return of 36.6%! This is why I sell put options for monthly income. 1 Option = 100 Shares of Stock: In this example, we sold 1 put option. In other words, we sold someone the right, but not the obligation, to sell 100 shares of stock to us for $67.50 on or before the option’s one-month expiration date (usually the 3rd Friday of the month). $ 2 = Our Options Premium: In exchange for giving someone (the put buyer) the right to sell us 100 shares of stock at $67.50, we get paid in cold-hard cash! In options lingo, we get paid in the form of a premium. In this example, our premium is $ 2 per share. Because each options contract equals 100 shares of stock, here our premium is $ 200. This $ 200 is deposited in our account at the time of the transactions. It is ours to keep no matter what transpires before expiration (the end of the contract). The stock prices stays above the 67.5 option strike price so the put option expires worthless. Put yourself in the position of the options holder (the person that buys the put option from us). The put holder purchased the right, but not the obligation, to sell 100 shares of stock at $67.50 per share. Assume this put option expires in one month. If, at the end of that one-month expiration time period, the stock is trading at a price above $67.50, why would the put holder exercise his right to sell the stock at $67.50 when he can sell at a price above $67.50? They would not exercise the put option! The investor keeps the $200 premium and has a 3.05% return in one month. The stock declines in price and is below the 67.5 option strike price. The option will be exercised and the shares of stock will be sold to us at the strike price ($ 72.50 per share). Again, put yourself in the position of the put holder for a moment. If, at the time the put option is set to expire, the stock is trading at $65, and the put holder has the right to sell shares of stock at $67.50, why wouldn’t the put holder exercise his right to sell the stock at $67.50 per share? They would. So in this scenario, the cash we previously deposited into our brokerage account ($6750) is used to purchase the underlying shares that were “put” or sold to us. 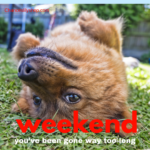 Our break-even point, also referred to as our “cost basis,” is now $65.50 ($67.50 per share we paid for the stock less the $ 2 per share put premium we received from the original sale of the put option). At this point, we own 100 shares of stock and can sell them or write a covered call trade. This is a simple example of how to sell (write) a put option for monthly income. Once we do this each month we create a stream of cash flow to help us achieve financial independence. Last month, we were successful on all put trades and averaged 3.5% return for the month. Imagine making $3000 or more in income each month! Start making more income each month by subscribing to the Monthly Income Plan.